Renaissance combines an Ultraviolet Sterilization Chamber with the power of pure oxygen (Ozone) to treat your water. These two naturally powerful processes eliminate 99.99% of all contaminants in water and reduce the use of pool chemicals up to 80%. No toxic chemicals are used, no metals or minerals, only pure light and pure oxygen. Using the existing pool pump, water is circulated through the Renaissance Chamber where it is sterilized to the quality of drinking water and then returned to the pool. The Renaissance Ultraviolet Ozone system kills bacteria and algae 100% Faster than chlorine. The Renaissance UV+Ozone system eliminates oils, lotions, and sunscreen from the water and effectively oxidizes regardless of pH level, stabilizer level, and water temperature. Unlike a salt system that stops generating chlorine when water temperatures go below about 60 degrees, the Renaissance UV Ozone system works all year around regardless of water temperature. Renaissance UV+Ozone’s one size treats residential swimming pools up to 40,000 gallons. The Renaissance Ultraviolet Ozone System Uses both Ozone and UV light in one system to create hydroxyl radicals for the most powerful oxidation know to science. At SoCal Pool Guys we often get asked “Why is the Renaissance UV+ Ozone so Unique and how does it compare to chlorine? Basically, Chlorine Kills Bacteria but the Renaissance UV+Ozone kills bacteria, viruses, spores, cysts, yeast and fungus. The Renaissance UV+Ozone kills what chlorine can’t and it also kills at a rate two times faster than chlorine. Chlorine becomes combined chlorine in order to oxidize which creates chlorine odor and irritation. The Renaissance UV+Ozone eliminates combined chlorine instantly eliminating the chlorine odor and eye irritation. SoCal Pool Guys knows eliminating the odor and eye irritation is very important to a lot of families especially with small children. While Chlorine requires pH below 7.6 to be effective the Renaissance UV+Ozone does not affect pH of the water. The Renaissance UV+Ozone is 100% effective regardless of the water’s pH. Chlorine also requires stabilizer to remain available but the Renaissance UV+Ozone is 100% effective regardless of stabilizer AKA conditioner (Cyanuric Acid) level in the pool. Chlorine reacts slowly and selectively in oxidizing contaminants but the Renaissance UV+Ozone reacts non-selectively and aggressively against every possible contaminants in the water. With all of this benefits that the Renaissance UV+Ozone system has over a chlorine pool the Renaissance UV+Ozone system does require a residual of chlorine in the pool of about 1 PPM for incredibly clean water free of algae and cloudiness. The Ultraviolet and Ozone (pure oxygen) naturally work together to eliminate 99.99% of all contaminants in the water while reducing the use of pool chemicals up to 80%. SoCal Pool Guys embraces the Renaissance UV+Ozone System. We believe this is a great alternative to owning a salt system or even just a chlorine pool. SoCal Pool Guys specializes in installing the Renaissance UV+Ozone systems and we have experienced the benefits first hand. We don’t think anyone can read the amazing benefits of the Renaissance Ultraviolet Ozone System without being duly impressed. Salt Systems that utilize a salt cell to generate chlorine are wonderful. 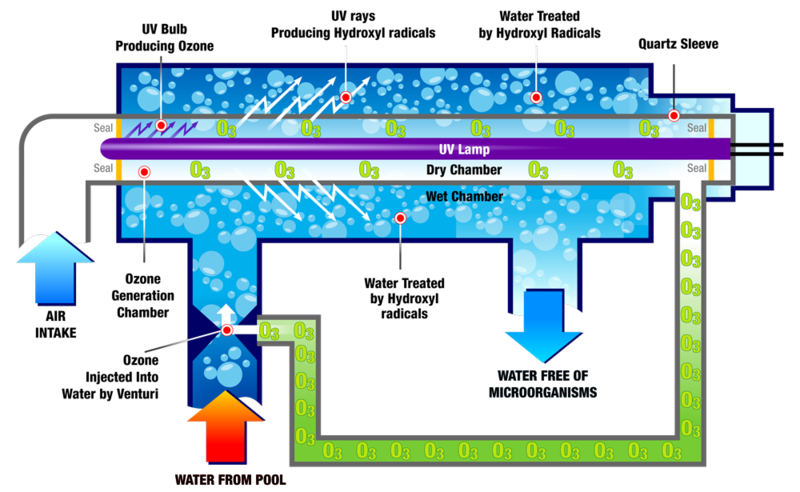 Where salt systems require a certain level of salinity (salt) in the pool to generate chlorine, SoCal Pool Guys enjoys that the Renaissance UV Ozone system doesn’t use any minerals or metals, just pure light and pure oxygen. The Renaissance UV+Ozone system has a Ultraviolet light for sterilization and uses Ozone (pure Oxygen) for oxidation. Sterilizing goes one step further than sanitizing. This is a process used to remove all micro-organisms. Nothing survives sterilization. Not yeast, bacteria, or fungus. If you would like to understand the benefits more fully or if you would like to get additional information on how it compares to various systems, please contact SoCal Pool Guys.